This is a cowl peg-top design, the skirt having side pockets and 5 pleats on each side of center front. 1) Trace outline of skirt front foundation, and divide bottom line into 3 equal parts. 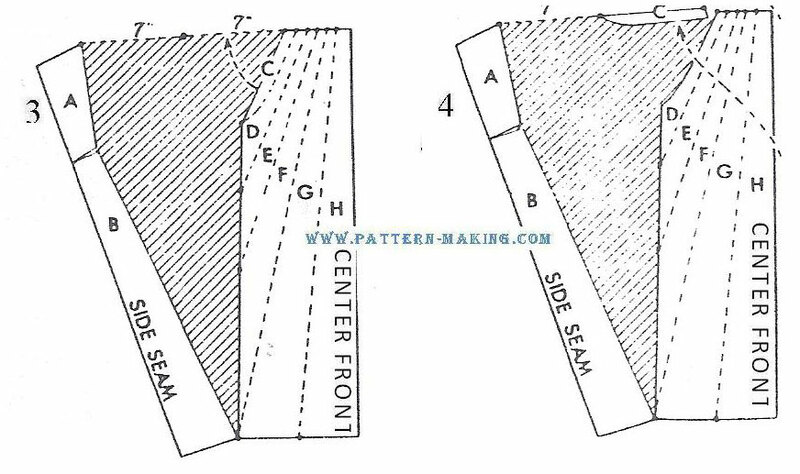 Draw slash lines for the pocket, cowl and pleats as shown by dotted lines; then mark sections A to H.
2) To straighten side seam line, slash between A and C, from waistline to hip and across to side: then spread, forming a straight line at side seam. 3 and 4) Continue slashing from hip to bottom, and spread 14” at top for a 7” loop for pocket opening; then slash between C and D and raise section C to the top as illustrated. cowl as shown in diagram. 6) Add pocket section as shown by dotted lines: then add seams and indicate pleats with notches. Mark grain line arrow parallel to the side seam, making front part of skirt bias. This will allow the pleats and cowl to fall in soft folds. 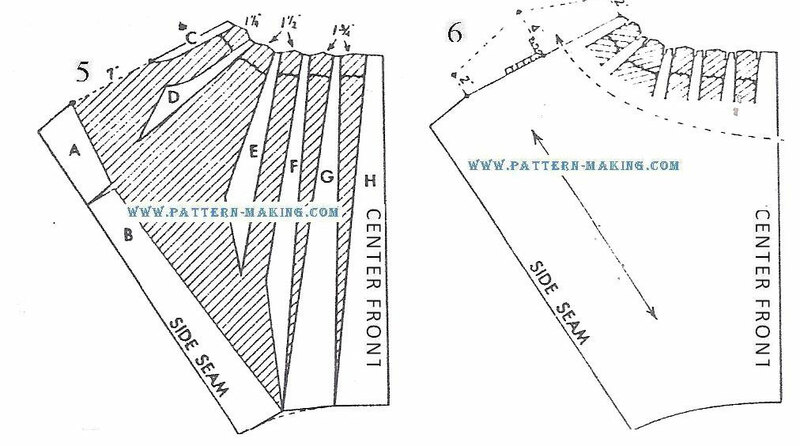 turn material right sides together, and join seam as indicated. Turn right side out. 8) Sew a stay piece inside to hold pockets and pleats in position. 9) This illustration shows outside view of skirt front.